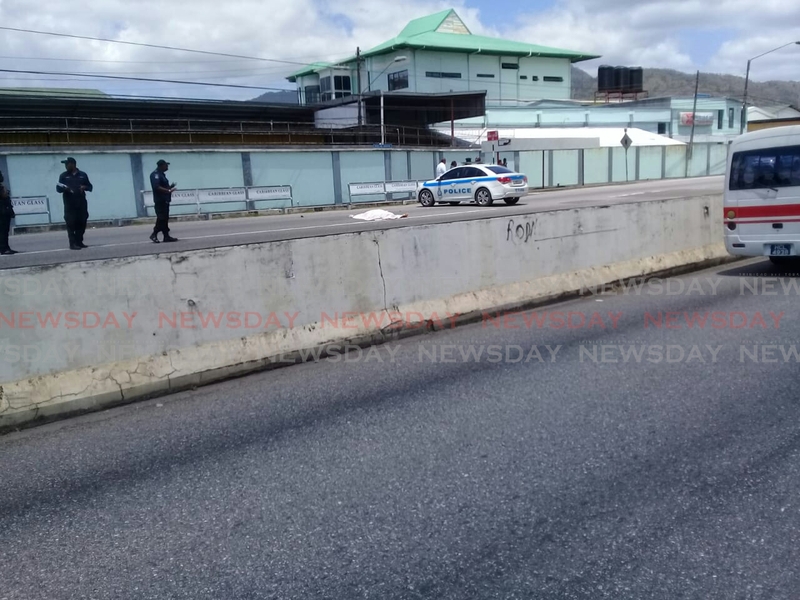 A man identified as 73-year-old Michael Barry was today seen lying dead on the Priority Bus Route at Third Avenue, Barataria, amid bloodstains on the ground after being hit by a police emergency vehicle at about 11 am. He was covered by a sheet and guarded by a heavily-armed police contingent which had otherwise cordoned off the eastbound lane. Several passengers in a passing maxi-taxi told Newsday they had also seen the damaged police vehicle at the scene. Barry, a retired TT Post worker, was slim, of a medium-brown complexion, clad in shorts, socks and shoes. His body lay about 15 feet from a nearby zebra/pedestrian crossing. A video-clip surfaced on social media showing a man taking a chance to hurry across the bus route but not in time to evade a speeding police jeep that struck him. The man, believed to be Barry, was clad in a yellow/orange jersey, blue shorts, white socks, shoes and a cap. Earlier this week, on Tuesday night, Shervon Medina, 46, was killed when she was knocked down by a car as she walked on the pavement along the Diego Martin Main road. That car was being driven by a by a special reserve police (SRP) officer that is yet to be charged for the offence. Newsday has dispatched a team to the scene in Barataria to unearth more details. Reply to "Man, 73, dies in Bus Route accident"